The 2nd Naval Zone is tasked with firmly managing and protecting Vietnam’s southern waters, islands and continental shelf. This is an important, difficult and complex mission. Being well aware of that responsibility, the unit has made every effort to innovate training work, making contribution to enhancing its combat power and successfully fulfilling the assigned tasks. The 2nd Naval Zone was established on 19 March 2009. It has been provided with favourable conditions for rapidly stabilising organisational structure, and numerous modern weapons and technical equipment since its foundation. Those provide the basis for the zone to strengthen its combat power to well complete its key role in managing and protecting national waters, islands and continental shelf within its areas of responsibility (AOR). Nevertheless, they are also challenges which require the zone to ceaselessly innovate and improve the quality of training, exploitation and master of modern weapons and equipment. Moreover, the unit has to conduct training while undertaking assigned tasks against the backdrop of complex developments within its AOR; and training many groups of troops and forces in a broad area, including isolated units such as DK1 rigs, radar stations, and so forth. These are great difficulties which have influence on training quality. On thoroughly understanding those difficulties and challenges, the Zone Party Executive Committee and Command have led and directed organisations and units to expedite many synchronous measures to innovate and improve training quality and combat power. First, the Naval Zone has promoted political, ideological education and cultivated officers and soldiers’ spirit and determination to complete their training mission. The Zone Party Executive Committee and Command have specified that only when they are well aware of the requirements and missions can they innovate comprehensively, synchronously and creatively. Accordingly, organisations and units continue to enhance their understanding of the Party’s military, defence standpoints and guidelines, and higher authorities’ directives and resolutions on training work, particularly the Central Military Commission’s Resolution 765-NQ/QUTW and the Naval Service Party Executive Committee’s Resolution 1050-NQ/DUQC on enhancing training quality for the period of 2013-2020 and beyond. On such bases, the party executive committees at various levels issue special resolutions to lead the training work and clearly identify concrete targets as well as difficulties and challenges; and thenceforth cultivate soldiers’ strong spirit, determination and responsibility for successfully fulfilling training mission. Organisations and units have stepped up party work and political work in training; regularly followed and firmly grasped soldiers’ ideological evolution to opportunely detect and deal with fearfulness of hardship, achievement disease, and so forth. In practice, to enable soldiers to properly identify their responsibility for training, the political, ideological education must be regularly conducted throughout the training process. At the present time, several units of the zone are equipped with some of the most cutting-edge weapons and technical equipment in the world, including fast attack crafts, anti-submarine warfare corvettes, auxiliary oiler and replenishment ships, and new generation of mobile coastal defence missile systems. The zone’s political, ideological education seeks to facilitate soldiers’ deep understanding of those huge resources entrusted by the Party, State and people to Vietnam’s People’s Army (VPA) with a view to improving its combat power, thus requiring the soldiers to attach importance to training to master and exploit technical, tactical features of new weapons, employ the weapons and equipment in an economical and safe manner, and so on. Furthermore, the zone has stepped up emulation movements; well performed propaganda; opportunely encouraged, praised and rewarded individuals and collectives with effective training methods and high achievements in training and combat readiness; and multiplied prominent examples. Second, continuing to comprehensively renovate training work to create robust, solid evolution in combat capacity and readiness. The zone’s goals and objectives for innovation are to improve training quality and level of operational readiness with the aim of successfully completing its tasks of managing and protecting national sovereignty over the southern seas, islands and continental shelf, and building itself in the “revolutionary, regular, elite, and modernised” direction. Given the features of the adversaries, operating environment and operational art of the Navy, the zone has actively undertaken comprehensive innovation in training; placed a strong emphasis on reforming management and control under the motto of “basics, practicality, and firmness”; promoted the task-based training approach which is close to the characteristics of the enemies and operational areas, and under the condition of the enemies’ employment of hi-tech weapons; and made major breakthroughs in training to master new weapons and technical equipment, and adopt safety regulations. In order to achieve effective innovation, the zone advocates bringing into play the role of party executive committees and commanders at all levels in leading, directing and heightening the advisory organisations’ responsibility for developing plans, instructing, supervising, and achieving consensus on the system of training manuals used for various forces, particularly those provided with new weapons and equipment. The training follows closely the subjects, in which officers spend more time with units than offices. Organisations regularly inspect, spur and work with units to conduct training and tackle emerging difficulties and problems. As for officer training, the zone has concentrated on enhancing quality of training courses and paid special attention to content which is new, unsound and inconsistent, with a view to raising officers’ comprehensive competence at all levels, particularly the abilities to give advice on operations and training, the abilities to organise, command, control, manage, and handle situations, the abilities to coordinate operations, and so on. It also seeks to make major breakthroughs in delivering intensive training for those who are tasked with receiving, managing, exploiting, and using new, modern weapons and equipment. 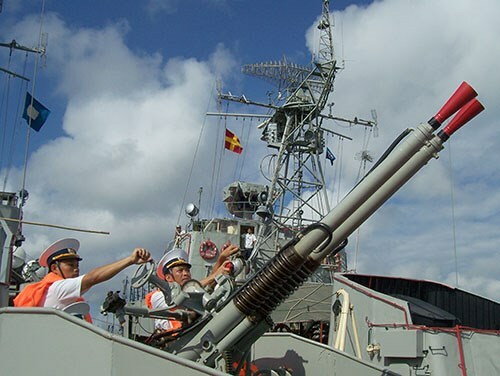 Regarding the ships’ commanding and executive officers, they are requested to undertake training so as to become proficient in using their own weapons and technical equipment, capable of using military equipment of other services and arms, and competent to independently navigate vessels under complex weather conditions. With respect to the corps of officers at the operational level, besides general content, the zone has focused its training on command and control in joint operations at sea and on islands under the new conditions while strengthening the ability to advise the Navy Command Headquarters to handle complex, sensitive situations in a correct, effective manner without being passive and unexpected, firmly defending the independence and sacred territorial sovereignty of the Fatherland. As for training the corps of technical personnel, the zone has attached importance to improving professional skills according to majors, ensuring the abilities to deal with technical incidents and master new, modern weapons and technical equipment. As far as the units are concerned, the zone has stepped up training in the direction of raising the regular and elite levels; placed emphasis on heightening technical, tactical standards and abilities to conduct independent defence operations for units deployed on the seashore and islands; and improved the seaborne forces’ abilities to hold combat drills in the waters, maneuver, coordinate operational efforts, and handle situations at sea under complex weather conditions. Apart from content innovation, the zone has actively reformed training methodologies. All the training content features highly effective teamwork and requires individuals and units’ long painstaking training. Meanwhile, the units have to perform their assigned tasks, leading to shortened training time. Consequently, besides undertaking training in the process of effectuating their missions, units are requested to properly reduce the amount of time allocated for theoretical training while increasing practical training in association with practical conditions and concrete missions of each unit. As for the modernised forces, officers who have received training abroad are tasked with translating and developing training materials, and directly giving lessons. At the same time, simulation technologies have been actively applied to training with the objective of developing soldiers’ skills while saving operating time of real weapons and equipment, making contribution to improving lifespan and quality of weapons and equipment. In the implementation process, units have constantly associated military training with political, ideological education; and aligned combat training with discipline training, establishing good order and discipline, physical training, and enhancing the abilities to adapt to severe environment, climate and hydrology. Thus, the zone’s integrated quality has been ceaselessly promoted. In 2017, it completed delivery of every content of political education and military, logistic and technical training to all of the subjects. One hundred per cent of the military personnel demonstrated their competence in live-firing exercises ashore, in which 95 per cent were graded as fairly good and good. Third, innovating technical and logistic training. The zone is provided with a great deal of modern military equipment and weapon systems, and operates in a harsh environment. These realities make the technical support in general and support for training in particular extremely important. Being well aware of that matter, the zone has exploited organisations and units’ proactiveness, creativeness and ability to get over obstacles to speed up innovation and enhance the quality of logistic, technical training with the aim of achieving two significant breakthroughs of the Naval Technical Branch, namely “establishment of good technical order and master of weapons and technical equipment” in association with “keeping ships in good order and building model depots.” On the other hand, the technical work has constantly followed demands of training content and ensured synchronicity, sufficiency, timeliness, quantity, and quality of ships, vehicles, weapons, and equipment used for various missions, particularly for long training exercises at sea. The technical branch has actively reformed training; enhanced capacity for exploiting and mastering weapons and technical equipment; ensured traffic safety; and strengthened repair capacity of technical stations and centres while stepping up emulation movements; bringing into play initiatives; carrying out technical innovation; translating and compiling materials; and designing models, learning aids and simulation equipment for training. Recently, the technical branch has successfully applied many research projects and technical innovation to training and combat readiness such as the guidance and control system simulation for the Project 12418 Molniya missile corvettes, batteries in the SET-40 torpedo, and so forth. Furthermore, the naval zone has attached importance to logistic training according to requirements and tasks. On the basis of approved logistic training plans, it has placed emphasis on aligning training with the enhancement of the emulation movement “the VPA’s logistic branch follows Uncle Ho’s teaching”; concretised the movement into norms in favour of the missions of training, combat readiness and building the zone’s logistic branch in the regular, modernised direction. Accordingly, it is important to establish robust logistic postures both ashore and offshore, and take initiative in preparing sufficient reserves of logistics for long combat training exercises at sea. Efforts made by the logistic branch have made substantial contribution to improving soldiers’ health, ensuring their fitness for training under the unique conditions of the Navy. Capitalising on achieved outcomes, the naval zone continues to innovate its training work and further enhances the integrated quality and levels of combat readiness and combat to satisfy the demands of firmly safeguarding national southern waters, islands and continental shelf.